On the eve of NATO Summit in Chicago on 21 and 22 May 2012 where the Review of the posture of defense and deterrence will be made public (Defence and Deterrence Posture Review), the issue of U.S. tactical nuclear weapons in Europe is back on the agenda. They were deployed in the mid-1950s by the United States and Russia. For both sides, they constituted a nuclear bulwark against a possible attack from enemy armies. For the U.S. side, their presence also translated a willingness to overcome the superiority of the conventional forces of the Warsaw Pact. The end of the Cold War greatly reduced the risks of a conventional attack, especially as the two former great powers signed the Treaty on Conventional Forces in Europe in 1990 in order to reduce their military presence on the Old Continent. With the breakup of the Soviet Bloc, the Russian Federation was forced in 1992 to withdraw its nuclear weapons from the territories of its former satellites and to install them on its territory along the western border or to destroy them. The Americans followed the same dynamics of reduction and destruction of large quantities of tactical weapons based in Western Europe. But nearly 200 are still spread over six NATO bases. Withdrawal or status quo, the debate rages: proponents and opponents invoking political, economic, security, strategic or legal arguments. This report provides an update on the evolution of the positions and arguments of the stakeholders. 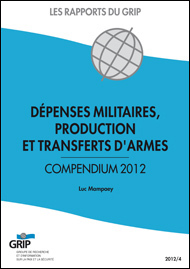 A distribution of the world arms imports according to the Human Development Index (HDI) prepared by the United Nations Program for Development (UNDP) indicates that the poorest countries in the world (low HDI) imported 14% of the global arms transfers in 2010. This is a sharp increase for the fifth consecutive year. Although eight states remain outside the Convention, the 188 States parties represent 98% of world population and 98% of global stocks of chemical weapons. Since their respective date of accession, all states are progressively fulfilling their obligations with more or less difficulties and more or less successes. If some of them have already implemented their international obligations at a national level, reported, destroyed their stockpiles and converted or destroyed facilities, provided technical and financial assistance to other states, others push back the deadline established by the Convention or granted by the Executive Board: among them, the major possessors of chemical weapons. 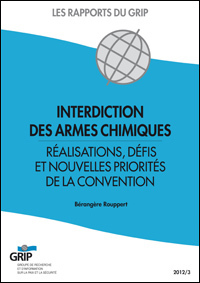 As the deadline for the elimination of chemical weapons stockpiles is approaching (April 29, 2012), the Organization for the Prohibition of Chemical Weapons, depositary of the implementation of the Convention’s obligations, must pursue its objectives initial, to rethink its priorities and objectives in order to adapt to new international security challenges, including the risk of proliferation.